Just like the various materials bits are made of, horse bits come in many different types of bit mouthpiece styles. Here are descriptions of the most common types you may see when choosing a bit for your horse. A bit with a mullen mouth is a plain mouthpiece, with a slight curvature so that it sits comfortably over the horse's tongue. This type of mouthpiece will be slightly more comfortable for a horse to carry than a straight bar mouthpiece. The mullen mouth is thought to be a gentler bit than one with a jointed mouthpiece, as there is no nutcracker effect when the reins are pulled. Mullen mouths are seen on both snaffle and curb bits such as mullen mouth grazing bits, or English and western-style pelhams. Rollers can be made of stainless steel or copper, or are often seen in an alternating pattern as on this full cheek snaffle. The function of the copper rollers is to encourage salivation, while the rollers themselves are felt to prevent the horse from leaning on the bit. The rollers increase the severity of the bit slightly. Rollers are also sometimes on bits with ports and spades. Ports can be quite low or very high. Some port will have rollers or keys. Both English and western bits may have ports. Single joints create a nutcracker effect that acts on the bars of the mouth, over the tongue and on the lips. For some horses, this bit may actually be easier to carry than a straight bar snaffle. French link mouthpieces have a flat peanut shaped link in the middle to make two links. The French link mouthpiece is thought to be milder than a single joint or mullen mouth and easier for the horse to carry. A lozenge bit looks very similar to a French link, but the straighter link puts more pressure on the tongue. Also called a Doc Bristol, this bit has a flat link in the middle, and looks slightly like a French link. The difference is that the link is longer and set at a slight angle, so the edge of the link has more bearing on the tongue when the reins are pulled. Like the French link, the Dr. Bristol has a slight nutcracker action. A Dr. Bristol mouthpiece is more severe than a French mouth or mullen mouth. The ball link of this bit sits directly on the horse's tongue. While the nutcracker effect is lessened, there is more pressure on the horse's tongue. This bit is slightly more severe than a French link, but less than a Dr. Bristol as there is no edge on the link to press into the tongue. Wire mouthpieces are very severe. They are thin, which concentrates the pressure on a small area of the tongue, bars of the mouth and lips. Wire mouthpieces can be straight, jointed or made with double offset twists. The wires can be made of one or a combination of metals. Many people feel wire mouthpieces are cruel. Twisted mouthpieces can be made from a combination of materials and may have a straight, mullen or jointed mouthpiece. They are similar to simple jointed snaffles, but a twist is formed into the mouthpiece. While not quite as severe as a wire mouthed bit, these are still very severe bits. The twists on these mouthpieces may be quite large, called a slow twist, or the twist might be quite tight. Chain mouthed bits use either a regular chain, bicycle or chainsaw link chain. These bits are very severe, and their use is frowned upon by most horsemen. Generally, the thicker the bit, the softer the action in the horses mouth. Some horses, because they have a low palate or large tongue may find very thick bits like eggbutt snaffles uncomfortable to carry. The thinner the mouthpiece, the more severe the bit will be, as it concentrates all the pressure in one thin area on the tongue and bars of the mouth. Keys are small elongated beads of metal and are most often seen on bits intended for introducing young horses to the bit. There are usually three keys attached to a center ring in the mouthpiece. You might see this bit called a mouthing bit. 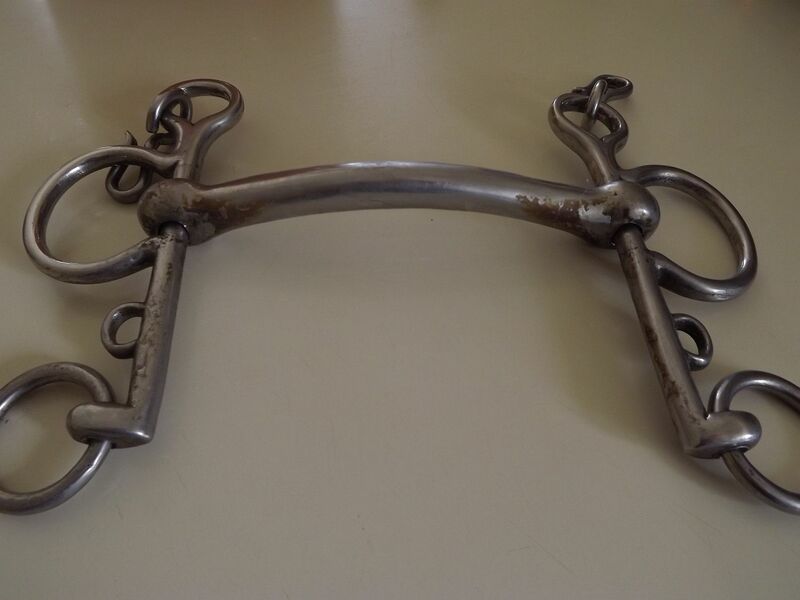 Many trainers no longer favor these bits as it is felt the bit encourages the horse to play with the bit too much. The use of the spade bit is rooted in vaquero tradition. The spade or spoon comes into contact with the palate of the mouth when the reins are pulled and because bits with spades or spoons traditionally have long shanks, the leverage can be quite great. In inexperienced hands, this bit can cause physical damage to a horse's mouth. The vaquero style of riding does not rely greatly on rein aids, and horses are taught to carry this type of mouthpiece after extensive schooling. It is not a bit to be used to training horses or correcting habits like pulling or head tossing. For most of us, this bit should be hung on our walls as a curio. A hollow mouth bit is a lighter weight than the same bit made with a solid mouth. Many horses carry this bit comfortably because of its weight. The half moon is another type of joint, and on this bit it is made of copper to encourage salivation. The half moon provides room for the tongue, while the double links soften the nutcracker action compared to a regular jointed snaffle. Is the Tom Thumb Bit Causing Discomfort to Your Horse? How Does a Correction Bit Work and What Does It Correct? Is a Bitless Side Pull Bridle Right for You and Your Horse?